The EZPack™ system is ready to use when you need it and it is customizable to fit your needs. It comes in a large variety of sizes. 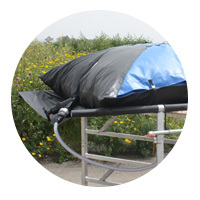 The outer bladder is made from durable materials and comes with a limited 3 year warranty. When not in use, it has a small footprint. All EZPack™ bladders are based on our proprietary 2-lyaer technology.